Podol is an old district of Kiev, where craftsmen and fishermen used to live. The district was formed after fire of 1811, when all the wooden constructions burnt down. Several slopes, including the famous Andreevsky Spusk, lead to Podol. The compositional center of Podol is large Kontraktovaya Square, where each house is interesting in its own way. Since 1798 the square was the place for al Russian fairs, and for the needs of customers the Merchants' Yard was put up. It contained 50 stores with various goods and products. Unfortunately the original building didn't survive until today, and the new building of the same look was constructed. Near the Merchants' Yard there is the fountain Samson, designed by Ukrainian architect Grigorovich-Barsky in 1749. The fountain is object of many legends, one of which says that the one who tries "Samson water" will stay in Kiev forever. 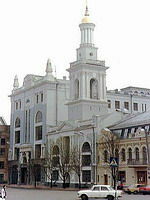 In this old district of Kiev there is the block of Kievo-Mogilyanskaya academy that was founded in 1632 and became the center of Orthodox education of Slavonic people. Such historical persons as Lomonosov, Skovoroda, Miloradovitch and many other studied in the academy. In Podol there is a monument to outstanding Ukrainian philosopher Grigoriy Skovoroda. He is famous for wandering around Ukraine and teaching people the laws of morality. He was against ostentatious religious devotions and propagated harmonious union of faith and mind. In Podol there are many attractions. Among them is functioning Florovsky Convent built in the 15th century and restored in the 19th century, elegant Iliinskaya Church that was built on the very place where ambassadors of prince Igor took an oath while making peace with Greeks. Nikola Pritisk Church, which is functioning now, looks like an old wooden Ukrainian temple. And when one is inside he or she might feel the atmosphere of the past. Near the Florovsky Convent used to be the first drug store in Kiev. Nowadays the building contains the museum of pharmaceutics and one of the largest drug stores in the city.